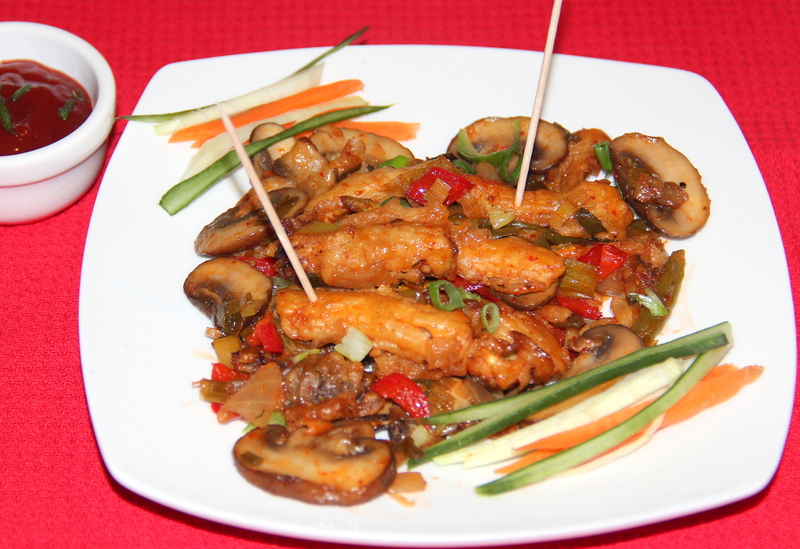 Baby corn Manchurian is a indo-chinese starter which is crispy, crunchy and dry version. In this recipe have posted both Baked and shallow fried version. There is not much of a difference in crispiness and taste. However for shallow fry requires an added focus taking less time with an added calories. So you can choose either to shallow fry or bake. In this recipe baby corn is coated in the corn starch & plain flour batter. Toasted using shallow fry or baking method and then sauted in sauces with onion, spring onion, capsicum. As a variation added mushrooms to this recipe. Vegetables and sauces can be personalized as per the taste. Rinse baby corn in warm water for 10-15 minutes, drain and chop them to half or as desired. In a bowl combine corn flour, plain flour, ginger-garlic paste, salt and mix well with 2-3tbsp of water to make a thick runny batter. Dip baby corn in the batter and coat them evenly. After coating this can be baked or shallow fried in the pan as per the convenience. Pre-heat the oven at 200deg C , line the baking tray place the coated baby corn in the tray and bake for 20-25 minutes/ until golden make sure to flip in between. Heat oil in the wok/tawa add crushed garlic, green chillies (if using) onion and saute for a minute. Add mushrooms, capsicum, and saute for 3-5 minutes until the capsicum and mushrooms are tender and crunchy. Now add soy sauce, tomato sauce, vinegar, salt mix well. Add fried baby corn stir until the sauce evenly coats the baby corn. Serve baby corn Manchurian hot garnished with spring onion greens. If you’re a spice lover can add chilli sauce instead. Baby corn can be deep fried but it might add few calories to your diet. Posted on August 9, 2014, in Indian, Side dish, Starters and tagged Baked Baby corn manchurian recipe, Chitras healthy kitchen, drchdietfood, Indo-chinese veg recipes. Bookmark the permalink. 43 Comments. Thanx Malar. …am crazy about baby corn now my princess has started liking it so trying variations. …. This sounds like a delicious side dish! Yummy.. Chitra, you got frozen baby corns or fresh ones? Thanx a bunch. I second you…have a lovely week end ..
Yum! Looks like one I need to try after grocery shopping this weekend. Thanx a bunch Liston. Glad you liked…have a lovely day…. Thanx Radhi. …have a fab weekend…..
Oooh… baked version sounds interesting! Must try it. Thanx Kan…..glad you liked…..have a lovely day…..
Great post! looks very tempting..
Thanx a bunch Deepika. ….